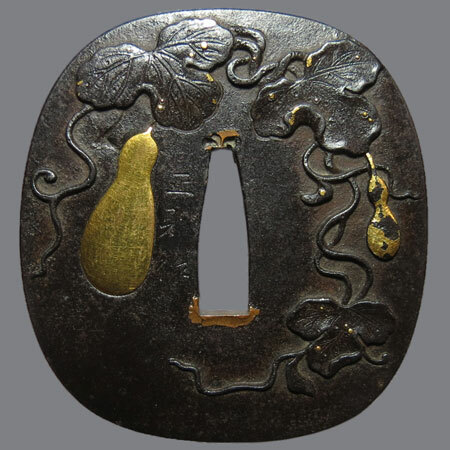 An iron tsuba with a bottle gourd (Hyotan 瓢箪) with leaves and steams carved in high relief. The gourd and small parts of the leaves are gilded, the dew drops are made with dots of gold inlay. Kozuka ana is cut in the shape of gourd and filled with gold. Author is an artist of the Ito school, who lived in Edo in the 1750-1800. 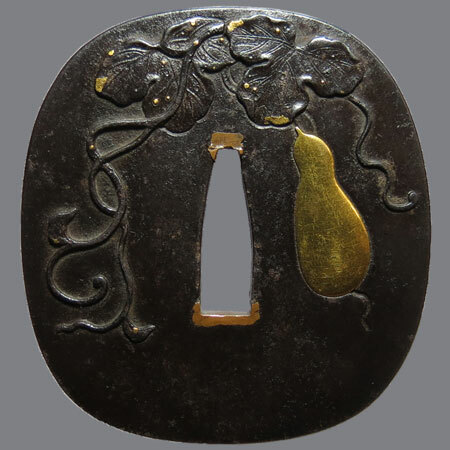 It is interesting that this tsuba is done in Nara style. The gourd design never was adopted as a family crest, probably because it is often associated with sake and, thus, drunkenness. However, Hideyoshi Toyotomi adopted a water gourd as the symbol for his banner when obtained a command in 1575. A big gourd was tied upside down to the top of the flag-pole, and additional small gourds added to it after every victory. It is called Sennaribyoutan (千成瓢箪) - “the thousand gourds”. When the number of gourds grew into a large bunch Hideyoshi came to be known as “The Lord of the Golden Water Gourds”. Since then, the gourd became a famous symbol of victory. 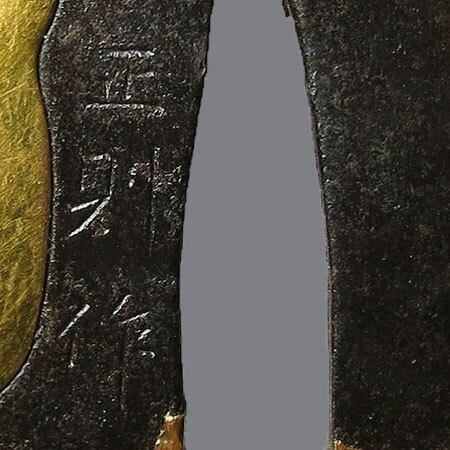 Inscription: 正則作 (Masanori saku). Ito school. Age - Edo. Iron, takabori, ten zogan and zogan with gold. Nagegaku gata, kaku mimi; 7,0 х 6,5 x 0,5-0,4 cm.